Beaux Arts architecture style is a theatrical and heavily ornamented classical style taught during the 19th century at the Ecole des Beaux-Arts in Paris. This style strongly considers the function of the space. The Library of Congress Thomas Jefferson Building is a textbook example of the flamboyant Beaux Arts style. In addition, the first congressional office buildings – the Russell Senate Office Building and Cannon House Office Building — were designed in the Beaux Arts style by the prominent New York architectural firm of Carrère and Hastings. In April 1904, John Carrère took charge of the Senate Office Building project (now named the Russell Senate Office Building), while Thomas Hastings oversaw the construction of an almost identical office building (now named the Cannon House Office Building) for the House of Representatives. Their Beaux Arts designs harmonize with the U.S. Capitol. Architecturally, the buildings’ elevations are divided into a rusticated base and a colonnade with an entablature and balustrade. The colonnades with 34 Doric columns that face the Capitol are echoed by pilasters on the sides of the buildings. Both buildings are faced with marble; the Russell Building's base and terrace are gray granite. The Caucus Room in the Russell Building is an excellent example of the Beaux Arts architecture style of architectural design. Grand, well ordered and richly detailed, the room provides a dignified environment in which important political meetings and social functions are held. It is the oldest and one of the largest assembly rooms built for the Senate outside the Capitol. The Beaux Arts architecture style is also particularly apparent in the Cannon Building Caucus Room. The room lies at the end of a progression of monumental spaces, which begin with the rotunda and continue in the marble staircases that land directly in front of the principal entrance to the Caucus Room. Through this architectural hierarchy, one is led from the building's "front door" directly and powerfully to the Caucus Room. Measuring 74 feet long by 54 feet wide, the room is treated with paired Corinthian pilasters standing on a continuous pedestal and supporting a richly detailed entablature including dentils, modillions and egg-and-dart moldings. The rich ceiling is decorated with a variety of classical motifs: rosettes, guilloch and Greek key. This room is the site of numerous dinners, receptions and other events each year. 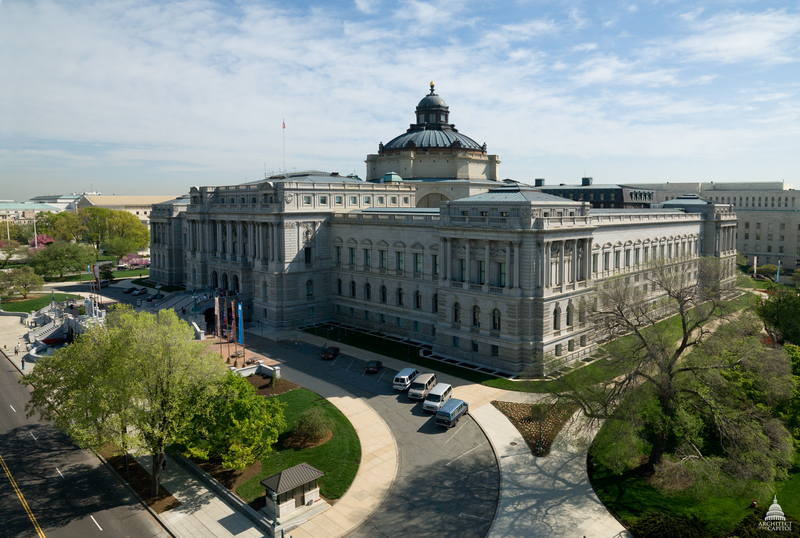 The Library of Congress Thomas Jefferson Building is recognized as a premier example of the Beaux Arts style, which is theatrical and heavily ornamented. It is a style perfectly suited to a young, wealthy and imperialistic nation in its Gilded Age. The materials – marble (15 varieties), granite (400,000 cubic feet), bronze, gold, mahogany – were expensive but would last a thousand years.